Charbax is still on his trip to China and today he succeeded in uncovering a new ereader based on LG Display's flexible 6" E-ink screen. 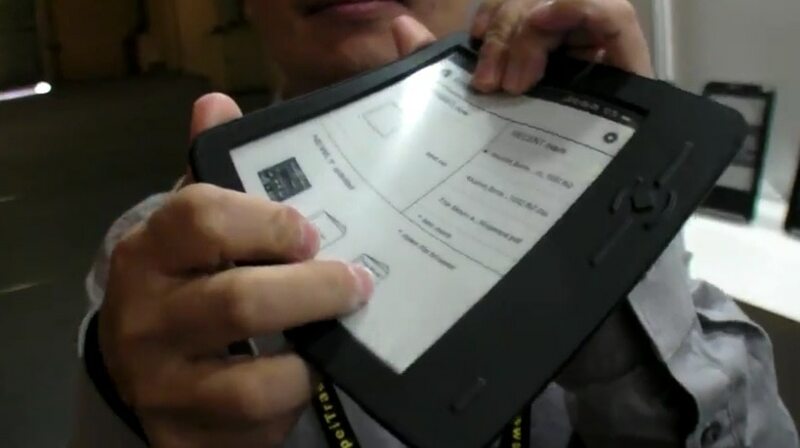 Yitoa is a Chinese OEM, and it looks like they are showing off as clone of the flexible ereader I held in my hands yesterday. The ereader that Charbax found in their booth bears more than a faint resemblance to the Wexler FlexOne (including the Wexler label on the back). Of course, there's a good reason for that; Yitoa is the manufacturing partner for Wexler. As you watch the video, note that the listed specs has the wrong resolution; this device uses the plastic backed screen developed by LG Display; the correct resolution is 1024x768. At 3:30 when he turns the device you can see wexler brand.